In case you haven’t heard, the brand new, 2018 Chevrolet Equinox is here! Whether you’re a Toledo college student or a working-class adult, this is the SUV for you. The elegant crossover SUV explores technologies ranging from teen driving applications that alert drivers of blind spots all the way to phone applications that allow you to start and stop your engine with your finger! The new, 2018 Chevrolet Equinox is a perfect family SUV that doubles in use as a sophisticated, practical, everyday vehicle. With an estimated 39 miles per gallon on the highway, this SUV is perfect for long commutes to work and family road trips. You can even keep your little ones occupied with the 4G LTE wifi hotspot! The 1.5L turbo engine and 6 speed automatic transmission make this SUV an easy drive and a smooth ride. The anti-locking brakes keep you and your family safe on the slippery, icy roads during the winter months and the automatic windows keep you cool in the summer. The new model comes in a variety of fun, fresh colors like Sandy Ridge, Orange Burst, and Ivy. If you’re wanting stick to more neutral colors, Chevy has you covered. The 2018 Chevy Equinox will still be available in the classic Mosaic Black, Summit White and Nightfall Gray. Give your new Equinox the sporty look you love with Chevrolet’s Redline series! The Redline series flaunts everyone’s favorite black bowties, black mirror caps, and signature 19” black wheels with red accents. All the windows accentuate a dark tint with black trim. The Redline design comes custom to each vehicle model, and is available on the 2018 Chevrolet Equinox LT.
Did you know that all Equinoxes come standard with the Chevrolet MyLink® audio system? The touch screen radio features a color display and a 7 inch screen. With Apple CarPlayTM and Android AutoTM, Bluetooth, and AM/FM radio, there’s a way to play music for everyone. Each of these 2018 SUV crossovers comes with the interior option of having universal tablet holders, regular or premium all weather floor-mats, and a horizontal cargo net! Exterior options include a front license plate mounting kit, keyless keypad entry, and two different 19” wheel options. 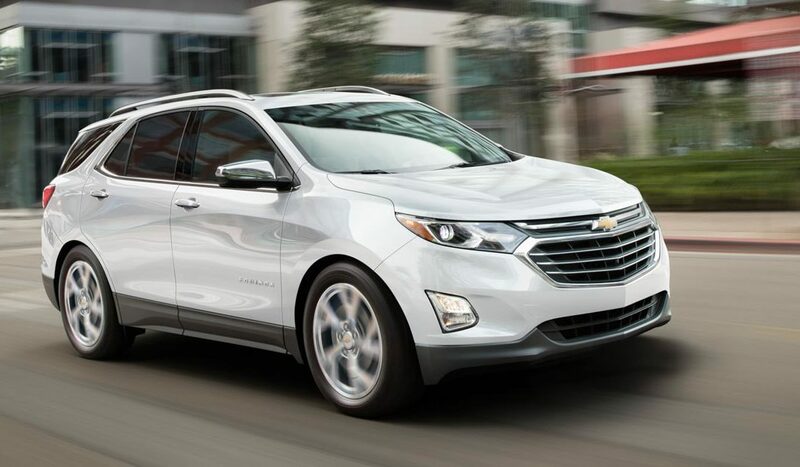 With so many capabilities and options, the new Chevrolet Equinox is the perfect crossover vehicle for anyone. They’re practical, classy, and safe. Get yours today at Snyder Auto Group. Visit our Chevy store located near Toledo, at 524 N Perry Street Napoleon, Ohio 43545.